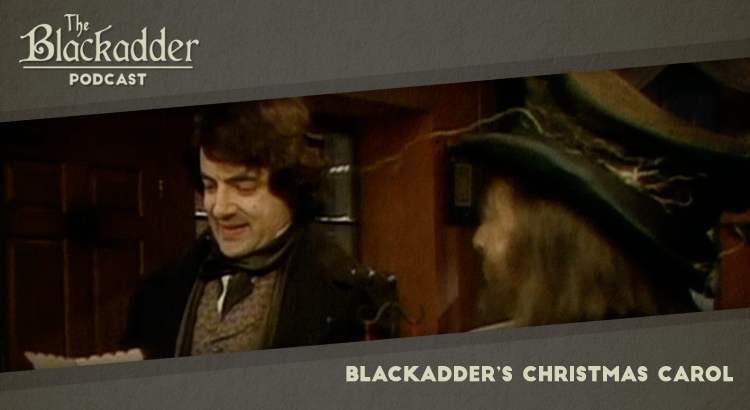 Blackadder’s Christmas Carol was a special festive episode of the show and features three of literature’s most memorable spirits combined as one and a monarch with the common touch. In this podcast Gerry and Iain consider whether Jo Rowling took significant influence from this episode when she created a popular member of her Harry Potter ensemble. Alongside the series regulars this special featured returning guests Robbie Coltrane, Miranda Richardson, Miriam Margolyes and Jim Broadbent (who we have of course still to encounter on the podcast). The show is a twist on the classic Dickens Christmas Carol tale as Mr Blackadder – the nicest man in the world – is visited by three spectres rolled into one. Blackadder’s Christmas Carol was written by Ben Elton and by Richard Curtis and directed by Richard Boden, his first stint in the chair ahead of Blackadder Goes Forth. Once again, John Lloyd produced the special and Howard Goodall was responsible for the music. Blackadder’s Christmas Carol was released in 1988. It is 42 minutes long and originally aired on the BBC. Blackadder’s Christmas Carol is presently available on Netflix and a remastered set of the whole series is available on DVD around the world (Region 1) (Region 2).